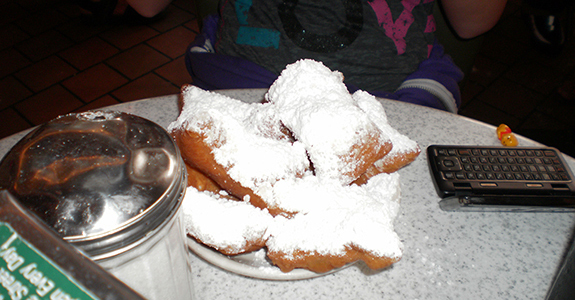 One of New Orleans more famous culinary treats is the beignet, and you will find none better that at the very famous Cafe Du Monde. Beignet are fried biscuits that are light and fluffy and sprinkled with powdered sugar-and are nothing short of heaven. You cannot visit New Orleans without having beignet at the original location right on the banks of the Mississippi river on the outer edge of the French Quarter that's been there since 1862. Walking up we noticed that this place is an open air cafe with ceiling fans whirring, packed with cafe tables and chairs, all filled with folks with little plates of beignet and cups of coffee. 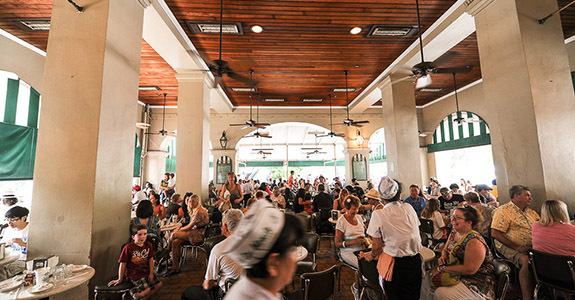 Besides beignet, Cafe Du Monde is also famous for their special brew which is made with chickory. Somehow amid the throngs we were able to cobble two tables and 7 chairs together for all of us to sit down and we ordered up from the roving waitresses. Within minutes our piping hot beignet arrived an order of 3 for each person. Warm and light and fluffy, everyone thought they were magical. The powdered sugar was everywhere, and as everyone took a bite, it even ended up on a few noses, but that's part of the fun. Yvonne and I each ordered the iced coffee which was unique and refreshing in the hot humid New Orleans heat. Sitting in my little chair, smelling the sweet aroma of the frying beignet, feeling the breeze of the fan, and listening to the hum of the crowd of people talking, I felt I was soaking up the essence of New Orleans-a vibrant, diverse, city that is an eclectic mix of European and Island influences. Everyone in our group agreed—C’est Magnifique!!! You can even purchase their coffee (made with Chicory) and their beignet mix to take home, or give as a gift. A culinary delight that is a DO NOT MISS!